NOTICE: Activation key must be used on a valid Steam account. Requires internet connection.ABOUT THE GAMEWar – the first Horseman of the Apocalypse – stands accused of inciting a war betweenHeaven and Hell. In the slaughter that ensued, the demonic forces defeated the heavenlyhosts and laid claim to the Earth. Dishonored and stripped of his powers, War must returnto Earth in search of vengeanc… e and vindication.KEY FEATURES Apocalyptic power: Unleash the wrath of War, combining brutal attacks and supernatural abilities to decimate all who stand in your way. Extreme arsenal: Wield a devastating arsenal of angelic, demonic and Earthly weapons; and blaze a trail of destruction atop Ruin, War’s fiery phantom steed. Epic Quest: Battle across the wastelands and demon-infested dungeons of the decimated Earth in your quest for vengeance and redemption. Character Progression: Uncover powerful ancient relics, upgrade your weapons, unlock new abilities, and customize your gameplay style. Battle Heaven and Hell: Battle against all who stand in your way - from war-weary angelic forces to Hell’s hideous demon hordes. Darksiders Warmastered Edition Features: Support for up to 4k video output resolution	Doubled all the texture resolutions	Re-rendered all cutscenes in high quality Rendering improvements and rework Better shadow rendering quality	Post processing effects	Optimized framerate	Wide Variety of Graphic Options (FOV, Postprocessing effects, Anti-Aliasing, Texture Filtering, Windowed/Fullscreen, etc.) Steam Trading Cards	Native Steam Controller Support	SYSTEM REQUIREMENTS Minimum: OS: Windows 7, Windows 8, Windows 10, DirectX 11 Processor: Intel or AMD Dual Core CPU Memory: 4 GB Hard drive space: 36 GB free Graphics: DirectX 10 Feature Level AMD or NVIDIA Card with 1 GB VRAM Recommended: OS: Windows 7, Windows 8, Windows 10, DirectX 11 Processor: Intel or AMD Quad Core CPU Memory: 8 GB Hard drive space: 36 GB free Graphics: DirectX 11 Feature Level AMD or NVIDIA Card with 1 GB VRAM© 2010 THQ Inc. Developed by Vigil Games. 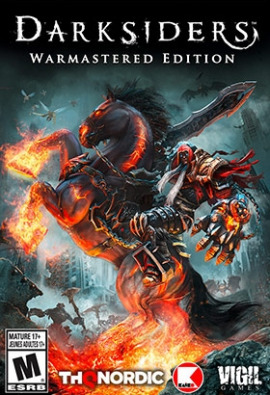 Darksiders, Vigil Games, THQ and their respective logos are trademarks and/or registered trademarks of THQ Inc. All rights reserved. All other trademarks, logos and copyrights are property of their respective owners.